Adam Charles Muir, military officer (b at Scotland 1766 or 1770; d at William Henry, Lower Canada, 11 May 1829). Alexander Forrester Inglis Cochrane, naval officer (b at Scotland 23 Apr 1758; d at Paris, France 26 Jan 1832). Arthur Brooke, career soldier (b at Ireland 1772; d at London 1843). Colonel Arthur Brooke is best remembered as one of the two key British commanders during the Battle of North Point (part of the Battle of Baltimore) in the War of 1812. Charles Lawrence, military officer, governor of NS (b in England c 1709; d at Halifax 19 Oct 1760). Though he lacked the backing of any influential patron, Lawrence enjoyed a successful career. 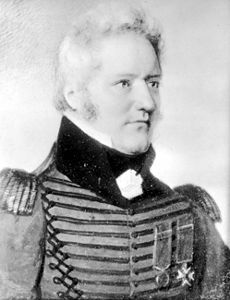 Charles-Michel d'Irumberry de Salaberry, British army and Canadian militia officer, military figure in the WAR OF 1812 (b at Beauport, Qué 19 Nov 1778; d at Chambly, Lower Canada 27 Feb 1829). At age 14, de Salaberry enlisted as a volunteer in the 44th Foot. Edward Baynes, soldier, military officer in the WAR OF 1812 (b unknown; d at Sidmouth, England, Mar 1829). Edward Baynes entered the army as an ensign in 1783. Edward Michael Pakenham, British army officer, military figure in the WAR OF 1812 (b County Westmeath, Ireland, 19 Mar 1778; d near New Orleans, Louisiana, 8 Jan 1815). On 28 May 1794, at age 16, Edward Pakenham became a lieutenant in the 92nd Foot. Baron Francis de Rottenburg, soldier, military figure in the WAR OF 1812 (b at Danzig [now Gdansk], Poland, 4 Nov 1757; d at Portsmouth, England, 24 Apr 1832). Francis de Rottenburg was the son of Franz Rottenburg, a merchant and landowner. Frederick Philipse Robinson, British army officer, military figure in the WAR OF 1812 (b Sept 1763, New York, US; d Sussex, England, 1 Jan 1852). Frederick Robinson was born in the British Province of New York. George Cartwright, soldier, diarist, entrepreneur (b at Marnham, Eng 12 Feb 1739 or 1740; d at Mansfield, Eng 19 May 1819). Cartwright entered the British army at 16, serving in India, Ireland, Minorca and Germany, and in 1769 he went on half pay. George Cockburn, Royal Navy officer, military figure in the WAR OF 1812 (b at London, England, 22 Apr 1772; d at Leamington Spa, Warwickshire, England, 19 Aug 1853). Captain George Downie, naval officer, military figure in the WAR OF 1812 (b at New Ross, Ireland; d near Plattsburgh, NY, 11 Sept 1814). 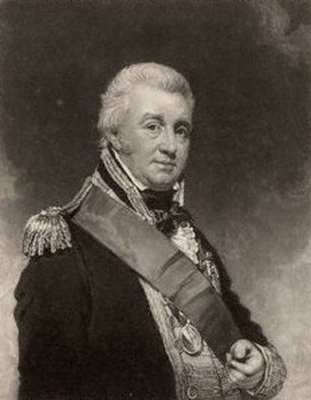 George Downie joined the Royal Navy in the 1790s and was promoted to lieutenant in 1802. 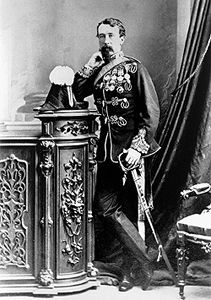 George Gleig, soldier, chronicler of the War of 1812 (b 20 Apr 1796 at Stirling, Scotland; d 9 Jul 1888). George Townshend, 1st Marquess, soldier (b in Eng 28 Feb 1724; d at Rainham, Kent, Eng 14 Sept 1807). Henry Milnes, soldier (birthdate unknown; died 25 August 1813). 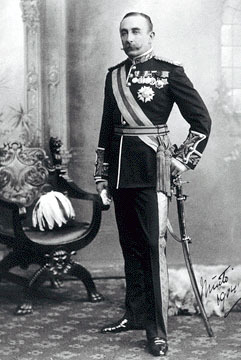 Captain Henry Milnes was an infamous figure more for his private life than for his soldiering. Henry Procter, army officer (b c 1763 at Kilkenny, Ireland; d at Bath, Eng 31 Oct 1822). Henry Procter was the son of a British army surgeon. He was considered by some as among the worst officers of the British forces in the WAR OF 1812. Hugh Palliser, naval officer, governor of Newfoundland (b at Kirk Deighton, Eng 26 Feb 1722/ 23; d at Chalfont St Giles, Eng 19 Mar 1796). He was a naval officer at the siege of Québec in 1759, and was appointed governor of Newfoundland 1764.